As we've previously reported, Jasmine Sokko's freshman single is certainly one of the more promising debuts we've seen so far this year. The song, entitled '1057' (read as "LOST"), was an elegant electronic pop lament on a uniquely millennial struggle for identity. The stunning track (mixed by Do Hits' Yllis no less!) also came along with a slickly-directed music video by Zake Production depicting an iron-masked girl embroiled in a frantic search. 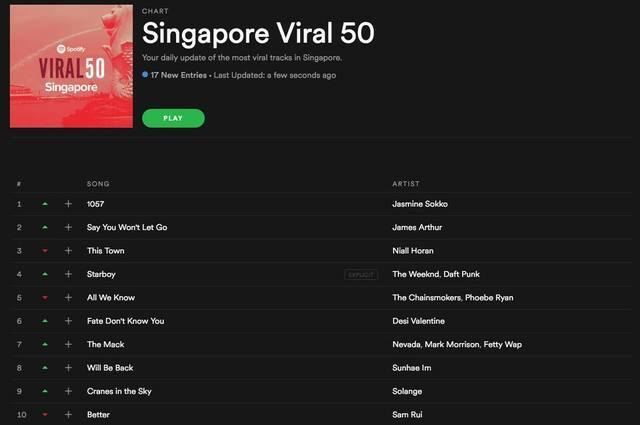 The buzz around Jasmine Sokko's breakthrough offering was certainly hard to ignore online and in real life, and today it appears as if Spotify's stats have backed up that hype because '1057' has hit the vaunted #1 position of the platform's Singapore Viral 50 chart! It sure seems like the young singer-producer is set for bigger things to come, and we're definitely heartened by the news that Sokko has more releases scheduled for later this year via 13 Orphans Records. In the meantime you can watch the music video for '1057' below.